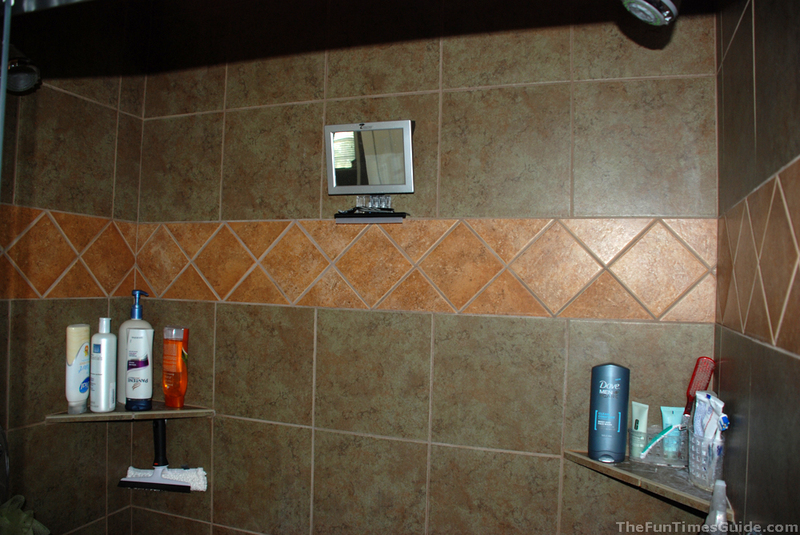 Looking For A Good Fogless Shower Mirror?… We Finally Found The Best Fog Free Mirror! Jim is a guy who shaves his head bald. He’s been doing so for over 10 years now. That means a fog free mirror in the shower is pretty much a necessity in order for him to maintain a smooth scalp on a daily basis. We’ve tried a number of other fog free mirrors in the past, and we even went so far as to meet with a mirror & glass company to custom design one for the master bathroom in our new log home (which we haven’t started to build yet). That one has built-in wires that heat up, keeping the mirror fog-free in a steamy hot bathroom — much like a rear window defogger in automobiles. I got the idea after seeing something similar in a home magazine. So when we were asked to try a ToiletTree Fogless Mirror, we were skeptical — simply for the fact that we don’t have a lot of confidence in store-bought fog free mirrors. They don’t stay on the wall for long. They don’t remain fog free for long. #1 – It comes with a “removable” silicone adhesive that keeps it securely attached to the wall. This works perfectly, especially when combined with the 2 supplied sticky pads. This mirror is not moving a bit! I was leery at first, and wondered just how removable the silicone adhesive would be. As it turns out, many high-quality mirrors and bathroom fixtures use the same silicone adhesive and it removes without incident (see below). #2 – It has a rather unique way of keeping the mirror fog-free. You simply slide off the mirror from its base prior to each use and fill the 1-inch compartment behind the glass with hot/warm water from your shower. After you slide it back onto the mirror’s base (which is a CINCH! ), the heat behind the glass creates those same de-fogging characteristics that the heated wires embedded in car windows do! The mirror truly does stay fog-free. The process of filling and emptying water might sound cumbersome, awkward, and like it would be a chore to do this each time you want to use the mirror. But I asked Jim (who does it daily), and he said it’s no big deal at all. 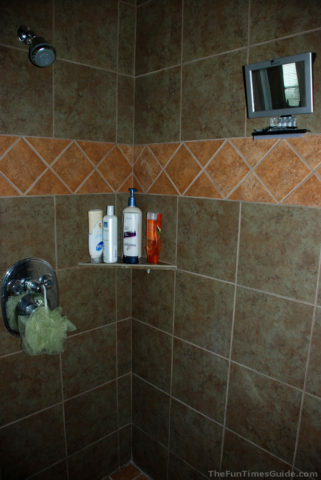 I suppose you could also position the mirror such that warm water from the shower head would automatically fill the back of the mirror, but we like having ours up and out of the way instead. Both ways work well though. First of all, the ToiletTree fogless mirror seemed a little small when I took it out of the box. However, Jim and I both think it’s the perfect size. We like that it’s up and out of the way, yet big enough to get the job done. You notice that it’s there, but it’s not obtrusive. As far as positioning the mirror on your shower wall… of course, you can place it exactly how high or low you want on the wall. But in addition to that, the part of the base that the mirror slides onto can be tilted up or down effortlessly. The best part: it “clicks” into place, so it’s never tilting too high or too low on accident. And that position can be changed on the fly to suit different users. In case you’re wondering… yes, we’ve bumped the mirror on the wall a couple of times, and that silicone is doing an awesome job of keeping the mirror in place. It hasn’t budged. And doesn’t seem like it ever will. There’s a handy little shelf right below the mirror (as with many fogless shaving mirrors) to hold your razor and extra blades. There’s a removable squeegee that initially seemed kind of silly, but since it slides right into the bottom part of the mirror (and stays out of the way while still being handy), it deserves a mention. Plus, the squeegee is exactly the same width of the mirror itself, so it just takes one long swipe to wipe it clean. It’s shatterproof, so it wouldn’t send shards of glass all over your shower if it happened to fall and break — which it won’t, trust me. That removable silicone adhesive works wonders! 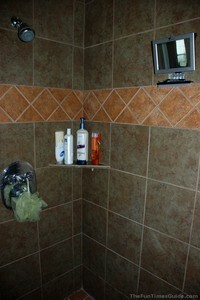 I’ve never had problems with other fogless shower mirrors rusting, but supposedly this one will not rust. It looks like it’s made of stainless steel (it’s not), so it really adds to a bathroom’s decor — rather than looking like cheap white plastic. 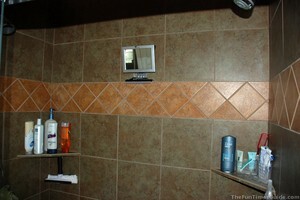 Jim and I especially like that our 2 main concerns about fogless shower mirrors have been addressed. The end result is a shower mirror that finally works. It stays fog-free and it stays on the wall!